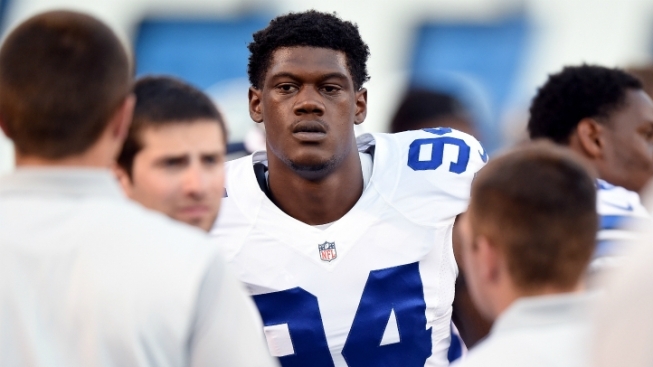 As recently as last week, Dallas Cowboys rookie defensive end Randy Gregory told reporters that he wasn’t ready to make any declarations about his return from the high ankle sprain that has kept him sidelined since Week 1. Now, it appears he is ready. Speaking to 105.3-FM The Fan this week along with teammate Jeremy Mincey, Gregory confirmed that he he expects to return this week against the Giants--but left the door open on how many snaps he’ll see. Gregory suffered the injury on September 13, his regular season NFL debut. "I have high expectations of myself... and the d-line included as a whole,” he said. “I have a good group of guys around me. As long as I stay invested in the film work and taking all those mental reps you don't necessarily get when you're out there playing. I've done a lot of that whether it's watching Jeremy or Greg (Hardy) or anyone in practice. I'm just trying to get my mental reps so that by the time I'm physically ready I'm mentally up to par and at the same time ready to compete at the same level."